Thompson Granite & Stone Inc. provides personalized service to customize the design of your kitchen countertop project or complete kitchen remodel. Serving families and businesses in Salt Lake and all along the Wasatch Front, we can help you select and install the perfect granite countertop. Thompson Granite & Stone Inc. specializes in timeless granite for your home, from kitchen countertops to fireplaces. Granite is made of natural stone with elements of feldspar, quartz, and mica. The material is originally mined in large blocks of rock. Stone masons apply the term granite to any rock with feldspar and visible crystals. As a result, several types of rocks can be covered by this description, including granite, granodiorite, anorthosite, and other rocks. Since granite has different textures and colors, it stands out among other stones, and it complements any style of cabinet. Granite varies in size and thickness and is less porous than other natural stones. It resists staining and is easy to clean. In addition, it is the most durable stone, so it can withstand direct heat from the oven. This makes it the most popular stone used for countertops. Because granite slabs are so large, with experienced fabrication, seams can be minimal. However, granite is not easy to repair, so proper care is essential for keeping your beautiful granite countertop in pristine condition. In areas of frequent use, sealing should be done annually, which is easy and inexpensive to do. Granite is a perfect stone for countertops in kitchens, bathrooms, fireplace mantles and even your patio. You will not regret choosing Thompson Granite & Stone Inc. as your Salt Lake granite fabricator and installer. We can show you how much you will enjoy the investment of having granite countertops in your home and business. 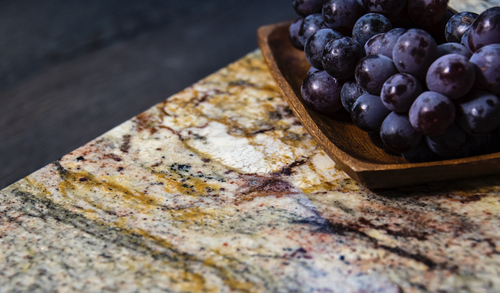 As a natural stone, granite is as unique as your personal style. Choosing the right granite color, thickness, and edges are all part of the custom design that Dwight Thompson will provide when working with you on your project.